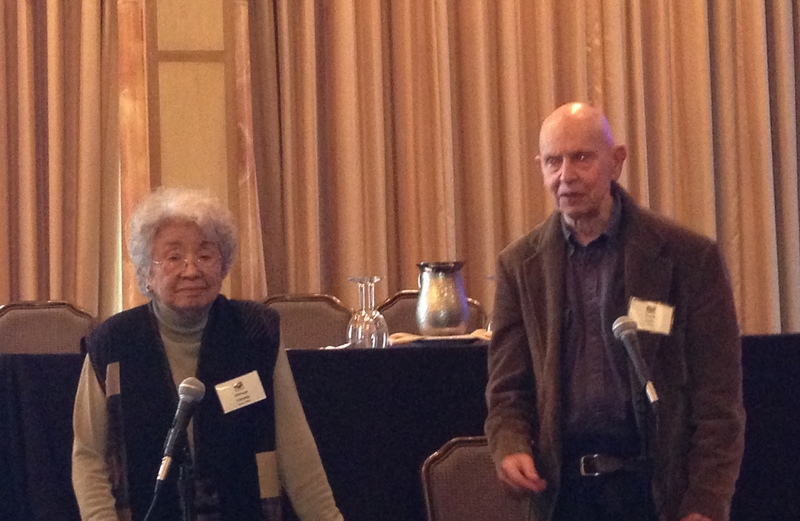 Two pioneering poets from Southern California, Mitsuye Yamada and David Antin, delivered a poetry reading, celebrating a lifetime of their wonderful work. Mitsuye Yamada was born in Japan. During World War II her family was removed to a concentration camp in Idaho. Her iconic book of poetry Camp Notes and Other Writings recounts this experience. She has been an ardent spokesperson for civil rights and international women’s issues. Mitsuye turned 90 this year and this reading of sections of Camp Notes was one of her many birthday celebrations. David Antin is a poet, critic and performance artist, who published ten books of poetry, including Talking, Talking at the Boundaries, Tuning, What It Means to Be Avant-Garde and John Cage Uncaged Is Still Cagey. He received fellowships from both the Guggenheim Foundation and the National Endowment for the Arts. Anton read from a selections from his recent book Radical Coherency: Selected Essays on Art and Literature, 1966-2005.